Factory Butte is the most recognizable feature of a large area of stark, barren land either side of the Fremont River known as the Upper Blue Hills, bordered by Capitol Reef to the west, the Henry Mountains to the south, San Rafael Swell to the north and the San Rafael Desert to the east. 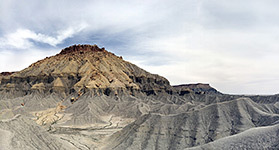 The topography is characterized by mud flats bearing sparse grass and occasional bushes, rising a little to extensive, undulating grey badlands and sharp ridges completely devoid of any vegetation, surrounding a few flat-topped hills of orange-brown sandstone, of which Factory Butte is a prominent example. Other, larger peaks include North and South Caineville Mesa, between which lies the small village of Caineville along UT 24 - a busy highway that runs through this strange, moon-line scenery for over 20 miles. Lesser roads lead to more remote areas, and one heads north close to Factory Butte, across featureless flats for most of the way but close to scattered outcrops of photogenic eroded rocks, yellow mounds and a few shallow slot canyons through unusual potmarked sandstone. 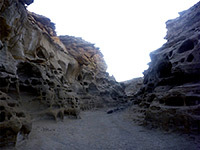 The appeal of this little-visited region is both in these small scale erosional features, and also the wider landscape, some of the most alien and barren terrain in the state. All the rocks of the Upper Blue Hills are part of the Mancos Shale formation, geologically more recent than most other parts of the Colorado Plateau. 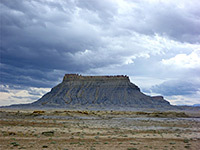 The top of the buttes and mesas is formed of the resistant Emery sandstone, overlying the Blue Gate shale which is particularly hostile to plant life and forms the stark bluish badlands that line much of the highway west of Hanksville. 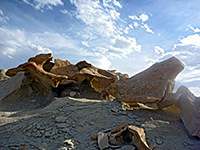 The occasional eroded sandstone formations found in the vicinity of Factory Butte, including hoodoos and small arches, are from the underlying Ferron sandstone, strata that also contain seams of coal, several feet thick in some places. There are several rough trails around South Caineville Mesa, and a few 4WD tracks to other places, but by far the easiest way to see some of the scenery away from the Hwy 24 is via the unpaved Factory Bench Road, which heads northwards past the east end of Factory Butte and is suitable for any vehicle (when dry) for at least ten miles, until the ground starts to become more uneven near Salt Wash, at the south edge of the San Rafael Swell; after here the track turns east towards Little Wild Horse Canyon and Goblin Valley. Factory Bench Road is well maintained by the BLM, who have installed information boards along the way, have designated several areas for (free) primitive camping, and even added rest rooms at one location. ORVs have a long history of use in the Upper Blue Hills but are not allowed in the vicinity of Factory Butte in order to protect two rare and endangered cacti species - Wright fishhook cactus (sclerocactus wrightiae) and Winkler pincushion cactus (pediocactus winkleri), both are found in isolated locations around the lower slopes. The road crosses a dead flat plateau of hard packed, greyish clay, covered only by sparse grasses, though this is still enough vegetation to nourish the cattle that roam these lands. 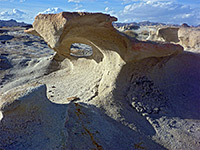 The smooth section of the road ends after ten miles at a coal pit, a good camping spot; immediately northwest of here is one of the nice eroded areas, a white rock plateau sprinkled with small, delicate formations including arches, narrow fins and tiny hoodoos, reminiscent of the Bisti Wilderness and other badlands of the San Juan Basin in New Mexico, and especially evocative near sunset. Other interesting sites are three narrow ravines that deepen just east of the road - two branches of Coal Mine Wash and Neilson Wash further south. 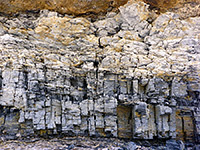 Both are narrow and enclosed for a while, cutting through whitish/grey or brown rocks whose surface has been eroded into many cavities. The northern drainage is also bordered in part by black coal layers, and is joined by several other tributaries as it widens and winds eastwards. Neilson Wash has more extensive narrows, stepping downwards via a few dryfalls, and is interesting to follow for half a mile or so; judging by tire marks this is also a popular ORV destination. Nearby towns with hotels are Caineville and Torrey.